We’ve spent the past 3 weeks basically just fishing and exploring Southcentral Alaska. We spent 10 days fishing and playing in a small dog-mushing community called Willow, where Corey and the kids caught an ample amount of Arctic Grayling. These were by no means “keeper” size, but they were fun to reel in, and Corey got a lot of use out of his fly pole! 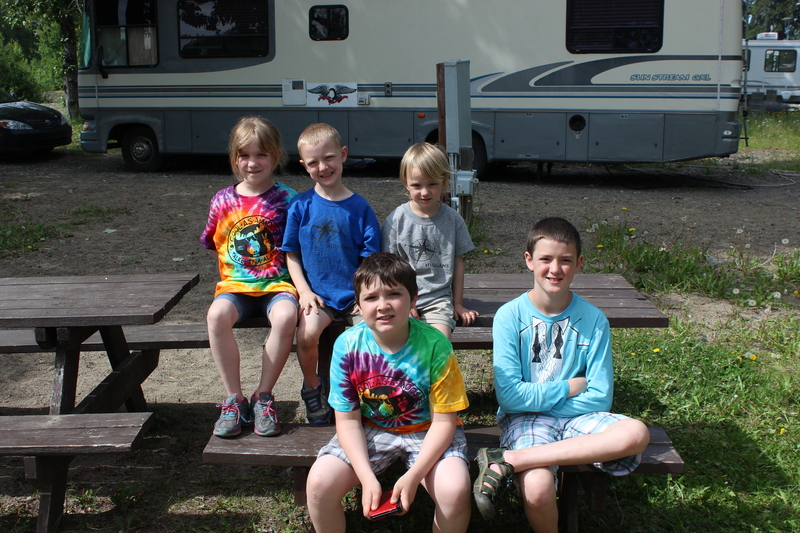 We camped at the Willow Creek Resort, and loved it! They were super friendly, had laundry facilities and hook-ups for the trailer, plus we could walk out the door of the camper, and right down to Willow Creek! Yep, beautiful, fun, and we even stayed long enough to make some friends! During a bit of a downturn in the weather, I tried my hand at making some sourdough donuts in the camper (please excuse the mess…we’re living in small spaces this summer, folks…small spaces…) You can find the recipe I used over at Under the Highchair. Trust me, these donuts are dangerous delicious. You will NOT be able to eat just one. A guy from a neighboring campsite came by at first and told us there was a fire about 5 miles away, and that we might want to be prepared to leave just in case it spreads. We have bad luck with forest fires, and we’d been hearing lots of emergency response vehicles drive by, so we slowly started packing up. 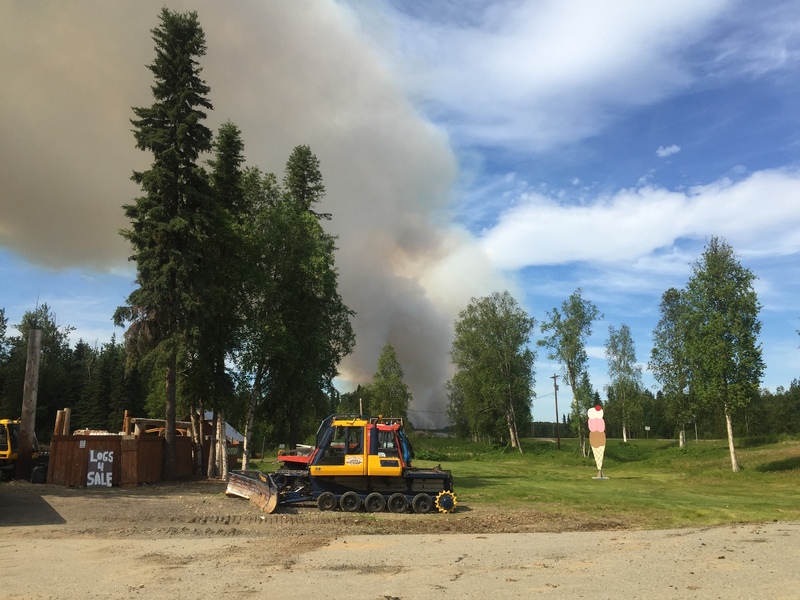 By 4pm that afternoon (this was a Sunday), the Alaska State Trooper came by to inform the camp owners that there was a recommended evacuation in place. We weren’t required to leave, but it was strongly suggested. We finished up our packing, and headed down the road. Turns out, that was the best plan. By Monday, over 7,500 acres were burning. That’s not an unusually large fire by Alaskan standards, but the fires here usually burn in the forests where no damage is done to private property. In the case of the Sockeye Fire, as this one has been named, many families have lost their homes. Because Willow is home to a very large dog-mushing community (it’s the official restart location of the annual Iditarod race) many of the families that were displaced also had to take entire kennels of 40+ dogs with them when they evacuated. At this point, 1 week later, the fire crews have done a great job securing the fire lines and families who can, are able to start going home. It’s not a totally happy ending, but the community has really banded together and it’s amazing to hear the stories of how they are helping each other out. We decided to make our next semi-long stop in Palmer, about 45 minutes outside of Anchorage. We’re prepping for Corey to be gone for a few days for work, so I needed to get settled with the kids somewhere with full hook-ups, laundry facilities, and showers. For those of you non-RVers, “full hook-ups” means that you connect your RV to electricity, water, and sewer. It’s still new to me, because up until January of this year, we had only ever dry-camped (camped with no amenities at all). So I usually spend the first day or two rationing water and telling the kids they have to walk up to the bathrooms to go potty instead of just using our bathroom in the trailer! 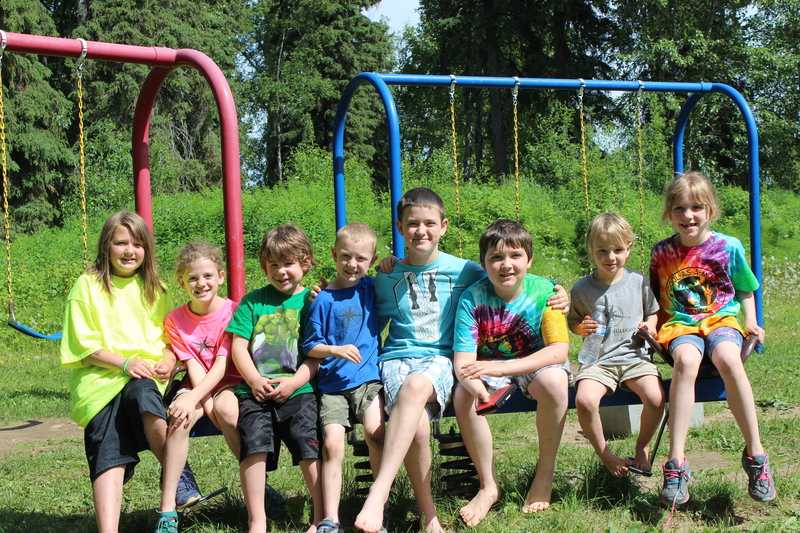 But, we got settled, and still had time to fish the Little Susitna River’s King Salmon Run (we got skunked – no fish, but the kids had a fabulous time playing in the river!) Plus, we drove out to see the Matanuska Glacier, the largest glacier you can access from a car in Alaska! And we’ve continued playing my new favorite game, “Jessica spots the moose!” This time, it was a combined effort, because these three beauties were literally right outside our passenger window when we drove around a small corner, and 4 of us shouted “MOOSE! !” all at the same time. The kids are learning to keep their voices to a low whisper when we spot wildlife, and I’m trying to beat my times to see how quickly and I can grab my camera from the case and have it ready to shoot a photo!! And that’s about it…glaciers, salmon fishing, wildfires, sourdough donuts, moose. We’re getting a taste of it all up here this summer. So, stick around! We’ll catch you after the next adventure!! It was awesome meeting and hanging out with you guys in willow!! Sandi, we feel the same way!! We hope we get to spend some more time hanging out before we leave Alaska at the end of the summer! And if you’re ever in need of a winter escape, come to California!! Next Next post: Better Late Than Never!